What Does 'American Made' Mean to You? A hot crucible at Engineered Precision Casting Company, Middletown, N.J. Photo by Mark Langlois. The words 'Made in the USA' are becoming increasingly relevant for reasons ranging from pride in workmanship to protection of corporate and national security interests. Here's a look at some of the forces that are driving companies to keep their manufacturing close at hand. It's a pretty dynamic landscape for American manufacturers today, much of it being spurred by enabling technologies, economic uncertainties, and agile business strategies that can quickly adapt to changes in market forces and customer demands. There's also a new administration in place that figures to alter the landscape in significant ways. Amid all the new developments, it's useful to hear what people in the thick of the action think. With that in mind, Design-2-Part Magazine reached out to manufacturing leaders– executives, entrepreneurs, and advocates– to hear their insights on the current state of U.S. manufacturing, as well as a number of issues relevant to the industry. What's the State of American Manufacturing Today? Scott Paul, president of the Alliance for American Manufacturing (AAM), gives it a passing grade, saying that "it's doing okay, broadly speaking," but faces significant challenges. While the automotive sector has been a real bright spot, leading the economic rebound from the Great Recession, there have been ongoing challenges with respect to global competition, he said in an interview. "In particular, firms that are in direct competition with China have, I think, very mixed experiences with that. And unfortunately, that imbalance has helped to dampen the potential job gains that we've so far realized. "Obviously, the political environment has changed quite a bit, and many people in manufacturing see a lot of opportunity for changes in public policy that would help grow manufacturing in this country," he continued. "A few see some risks to progress, as well. And, underneath all of this is the fact that technological progress, innovation, and management practices continue to evolve. And I think that will inform the future of manufacturing as well." What Does 'Made in the USA' Mean to You? Paul believes that when a label reads 'Made in the USA,' every bit of the product should be made in the USA, other than if there's a minimal exception. "I think the label is something that a company should have to earn because it is a valuable brand that is beloved by consumers, and it should be real. There needs to be some brand integrity, so I'm for a strong labeling requirement and a strong content requirement for such labeling." Keith Krook, business development manager at General Foundry Service, a manufacturer of precision castings in San Leandro, California, said that for him, the designation 'Made in the USA' applies to most of the raw materials, as well as the efforts that the labor force and subcontractors put into the product. "I don't think it's necessarily the quality," he told D2P in a telephone interview. "It's about being proud to be an American. We're very patriotic here. We have a very strong labor pool– they're all Americans– and a strong supplier base. Most of the suppliers that we use are in the United States. We're proud to make an American product because it's an American component that goes into an American product for our customers." For Bill Dubovick, the words "Made in the USA" conjure up a couple of phrases, including "the buck stops here and the buck stays here." Dubovick, the president of Engineered Precision Casting Company, Inc., a casting foundry in Middletown, New Jersey, said he likes the fact that the dollars stay in the United States and don't go overseas. Another phrase that comes to mind is "pride in workmanship," he said. "I believe we have the best global workforce; I just do," Dubovick said in a telephone interview. "I always have. I've been a huge proponent of Made in America, and I believe that the reason why our company has been successful is my people– above all, my people, and I take great pride in those guys. We're problem solvers, we innovate, and we don't imitate. Overseas, they imitate. I don't believe they have the innovation that we do. I think we're still way ahead of them on those grounds." Steve Blue, president and CEO of railway safety products manufacturer Miller Ingenuity, believes that the Made in the USA label will get a boost from the current administration's "Make America Great Again" slogan. But he cautions that any traction gained may be short term unless CEOs of manufacturing companies clearly explain what Made in the USA means and the benefits it implies. 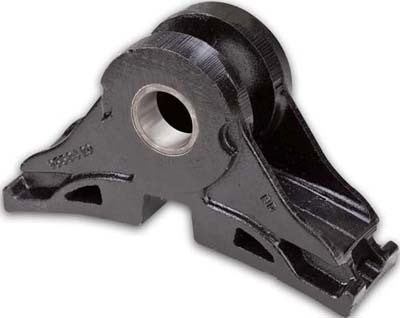 A brake head assembly manufactured in the U.S. by Miller Ingenuity, a Winona, Minn.-based maker of railroad parts and railway safety products. Photo courtesy of Miller Ingenuity. "I know what it's supposed to mean, but a few decades ago, Deming went over to Japan and taught them the Continuous Improvement system, and then the Japanese had some of the best products in the world. So did the Chinese, by the way, and so did the Germans, and so did a number of other countries. So Made in the USA is a label, but it doesn't necessarily mean that the quality is the best out of the product that's made in the USA. I know that in my company and in a lot of other companies, it is, but Made in the USA is a label that CEOs need to start attaching some meaning to, and conveying that meaning to the marketplace. In my particular case, that means saying "Here are the quality aspects and dimensions of my product that you won't find in other products; here are the sustainability aspects in my product that you won't find in other products with the Made in the USA label." For those who are unaware of the impact that manufacturing has on the American economy, Scott Paul, president of the Alliance for American Manufacturing, explains why it's important that companies manufacture in the U.S., as opposed to going overseas. "Manufacturing punches far above its weight in our economy," Paul told D2P. "And even though manufacturing directly employs just under 13 million Americans, the logistics and services and other types of jobs that it directly supports adds millions and millions of jobs on to that. And, indirectly, because manufacturing workers tend to be higher skilled and more productive, they are paid more than much of the rest of the private sector. And so those larger paychecks get spent in the community, and that, in turn, produces more economic activity. So we could have more grocery stores and bars and hardware stores, and anywhere else that the factory worker can spend his or her money. And that becomes a virtuous cycle. "The other benefits of manufacturing that extend beyond jobs include its outsize contribution to our exports. Again, even though manufacturing only accounts for 12 percent of our economy, in any given year, manufacturing can account for up to 60 percent of our exports, two-thirds of private sector research and development, 90 percent of patent filings, and irreplaceable contributions to the security of our country because of the presence of the defense industrial base that is embedded within manufacturing, as well." Why Do Companies Want to Manufacture in the USA? Steve Blue knows why he wants his company, Miller Ingenuity, to manufacture in the United States. "I want to manufacture in the U.S. because I think if you create the right conditions for the United States worker, they're the best," Blue told D2P. "They're still as good as they were in World War II if you get the right people. And so, to me, as long as you treat people properly, I guarantee you that you'll get more ingenuity from an employee under the United States form of government than you will from the Chinese form of government. And I've done business in China; I still do business in China. I had a joint venture there 30 years ago, before joint ventures were popular." People subjected to the kind of government found in China, Blue said, are at a disadvantage when it comes to innovation because they've not been encouraged or shown how to be innovative. Not so with most United States workers, who have generally been in environments where innovation is encouraged, and certainly not discouraged, he said. "So, pound for pound, there's no question in my mind that the American worker is the best worker on the planet if they're treated properly and they're supported properly. That's the number one reason why I like doing business in the United States." General Foundry Service's Keith Krook said that OEMs and product manufacturers want their parts to be manufactured in America because of the advantages that come with proximity to the supplier, the service that they receive, and the ease of communications when doing business. They also don't like having their products copied, he said. "A lot of our customers are finding that the price is low, and the quality is lower overseas," Krook told D2P. "They admit they get what they pay for. But ultimately, they want a better product and are willing to spend a little bit more money to manufacture it here in the U.S. We're also finding that the costs overseas may be creeping up because they're putting more infrastructure in Asia, primarily in China, and the prices of raw materials and the prices of labor are going up." Krook also acknowledged seeing signs, on the West Coast, that OEMs and product companies are working to establish relationships with suppliers that are not only American, but located within the same region or locality. These efforts to establish a more regional or local supply base are motivated by a desire to lower costs, he said. But being in the same time zone also enables the supplier and the OEM to easily drive to each other's facilities to work out details of a program that may need fixing, he said. 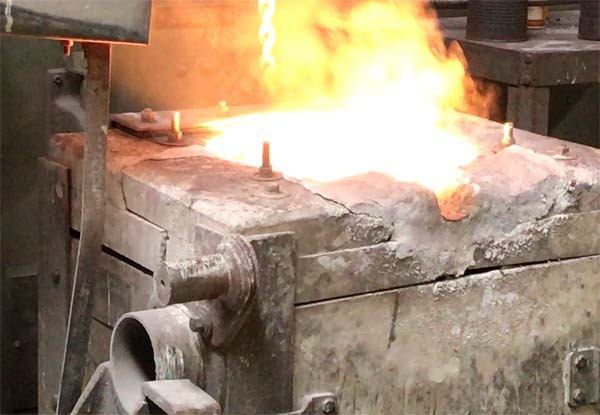 For more on General Foundry Service, see Casting Moves from Ancient Art Technique into Computerized Modern Foundries. Bill Dubovick, president of Engineered Precision Casting Company, said that domestic manufacturers are generally able to offer their customers certain things that overseas suppliers can't– speed to the marketplace, precise communication, and consistent and reliable quality. "Overseas, they do a pretty good job, but they cannot compete with us on that basis," Dubovick told D2P in a phone interview. He's aware of people who've gone overseas and were stymied by a language barrier and issues relating to specifications and tolerances. "I hope there's a peace of mind for my customers, when they buy from me, that we're going to stand behind our products 100 percent," he said. "And if there is a problem, we're going to correct that problem very quickly. I'm not sure that happens overseas." Some 10-to-15 years ago, Dubovick said, Engineered Precision lost a fair amount of business to overseas competitors, a situation that got company managers thinking about what they needed to do to compete successfully. One thing they knew was that they were never going to compete with overseas suppliers on a price issue. So they decided, as a company, to change gears and move toward the aerospace and defense industry. Whereas EPCO's customer base had previously been about 40 or 50 percent aerospace companies, it now had 75 to 80 percent in aerospace and defense. "We decided to build a product that obviously has a higher value and less competition, particularly overseas," Dubovick said. "We've decided not to fight the Chinese, or any Eastern company, with price. That is just not going to be us. We're going to beat them with our quality, and we're going to beat them with our speed to market and, hopefully, with our ingenuity, which is key." For more on Engineered Precision Casting Company, see Casting Moves from Ancient Art Technique into Computerized Modern Foundries. Shawn Hopwood, chief marketing officer and vice president of sales for 3D printer manufacturer Type A Machines, of Oakland, California, said that another reason for manufacturing in the U.S. is that it offers more protection of corporate or national security interests as more and more parts are being 3D printed. As the digital file for a 3D printed part moves through its process and into a 3D printer, there's potential, Hopwood cautioned, for corporate or national security issues to arise. "That part might find its way into a machine that's from another country, and it may actually find its way back to that country," he said in a phone interview. "So the opening for privacy and espionage and IP theft, we think, is applicable to 3D printing as well. And so we think that as more and more national security issues with 3D printing become more obvious, then, making a product in the U.S., where you have some privacy, where you have some legal recourse, is going to be important." 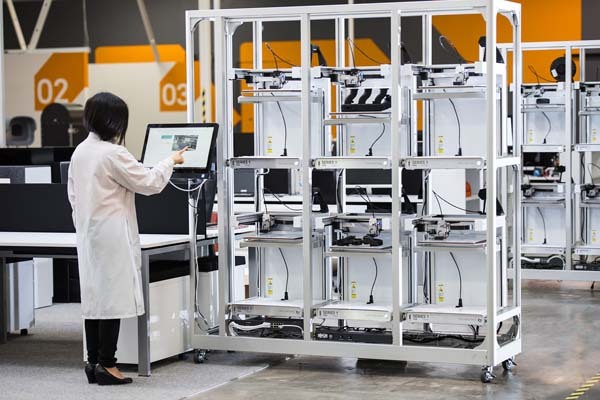 Manufacturers can increase the scale of their 3D printing production using Type A Machines' Print Pod, which allows simultaneous production of multiple jobs using multiple materials. Photo courtesy of Type A Machines, Oakland, Calif. Being located in the Bay Area-Silicon Valley region, a hub of advanced manufacturing, also has its benefits. It's hardly a cheap area to live and work in, but Hopwood said that the benefits are worth it for what Type A Machines is trying to accomplish. "We're in the hotbed of an ever changing hardware and software ecosystem," Hopwood told D2P. "So when we have the Internet of Things that's coming on line, we have to factor those things into how it impacts our products, how it impacts manufacturing, and we can get a lot of that input, and a diverse set of viewpoints, because we're here in Silicon Valley– both from the hardware, as well as the software, perspective. "Being here in Silicon Valley allows us to tap into that range of diversity around hardware, electronics, design, and software to do things that we see as critical to the future of enabling 3D manufacturing to be a viable methodology for manufacturers. And so how do we get there? It's not just doing hardware; it's not just having software tools. It's really combining and creating– for example, what Apple has done with an integrated product that really combines design, hardware, and software. "It's an expensive way to go, but it also matches with our corporate philosophy around, for example, not sticking cheap parts into a product," Hopwood said. "This might not be the case for every manufacturer, but we're looking to basically lead the industry and be a beacon. Where there's quality of the parts, where there's quality of innovation, and quality of manufacturing– all of this just ties together, and so we do not see that we can skimp by offshoring any aspect of what we do. We don't offshore our software development or our manufacturing." The desire to manufacture in the U.S. is also shared by companies headquartered outside of the nation's borders. Foreign direct investment has intensified in recent years as foreign companies set their sights on the American market. "We've certainly seen that in the automotive sector, and we've seen that in other sectors, as well," said Scott Paul, the president of the Alliance for American Manufacturing. "Part of it is that we are perceived to be a good place in which to invest. We have a large consumer market and, because of the nature of manufacturing these days, we have highly skilled workers who, even if they're paid more, can offset some of that low cost advantage that, particularly, developing countries have, through productivity and some of the other factors that go into total cost." Despite these investments in the United States, Paul doesn't want to pretend that there aren't serious competitive challenges to overcome. "We have a large goods trade deficit, and we've had slower growth in this country over the last 16 or 17 years than we've had traditionally. So we're going to have to work at it. None of this is going to come back by itself." Although much work remains to be done, Paul said that more companies are beginning to understand how to make manufacturing work in the United States, rather than going offshore. "There's a greater understanding of what some of the benefits of that would be, and what some of the drawbacks of globalized supply chains are," he said. "Shipping can be costly and erratic. It works fine much of the time, but it also can be an impediment. Energy costs, I think, are more variable overseas than they will be in the United States, with our domestic supply of energy. Quality and inventory control, protection of intellectual property– all of these things are easier inside the United States. "And it also looks like you have a president who is poised to potentially make it more expensive to import, one way or another, through the tax code, through trade policy, or through naming and shaming. And so I think that every sourcing decision will bring that into the calculation, as well. And then there are the trends in industry, moving towards Industry 4.0, with more flexible factories and more automated processes. It doesn't mean that work is going to disappear; it just means it's going to change. All of that points towards localized production. "And, I think that the United States, in many ways, is an underserved market. We have high import penetration in advanced technology products, and in things like clothing, as well. I think that we're starting on the upswing of a trend that will see more goods made in America. It's not going to look like 1950s America, but it'll be a 21st century version of a country that is making more of what it buys." Engineered Precision Casting's Bill Dubovick said that he is very optimistic about his company's prospects for the future, in light of an anticipated buildup of the nation's defense sector. "I think the next few years are going to see a real rebirth," he said in a telephone interview. "I think that the administration change is going to be huge for us. I think we're starting to see it already. I'm starting to see some work come in, and I'm told that these are long lead time items for military jobs that have been released and have been on hold for some time. I think that's going to grow, and we're just scratching the surface. I think in a couple of years, it's going to be extremely busy on the defense side."